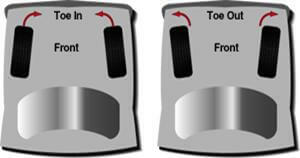 Wheel alignment has become a critical aspect of tyre fitting. Modern cars have increasingly complex suspension design, tyre technology and larger wheel diameters. Your steering, braking, accelerating and even parking relies on correct wheel alignment and balancing. Incorrect wheel alignment can lead to disaster on the road. So it’s important our team of enthusiastic technicians have an intimate understanding of wheel alignment and its relationship to real world performance and function. So if something “Doesn’t feel quite right” in your car see us at Tyrepower Orange for a wheel alignment and balance. Correct alignment is critical for safe handling and long tyre life. While many older cars only need front wheels aligned, many newer cars also need rear wheels aligned. You should always have a wheel alignment completed when fitting new tyres and approximately every 10,000km to get the longest life from your tyre investment. Tyrepower Orange provides wheel alignments in Orange.